The thicknessCONTROL MTS 7202.T thickness measurement system is beneficial in relatively simple applications due to its excellent price/performance ratio, its C-frame design and is available in two performance classes. Both operate with optoNCDT LL line triangulation sensors with optimised ratio between precision and measuring range. The integrated controller of the thicknessCONTROL MTS 7202.T system calculates and visualises the measured values. 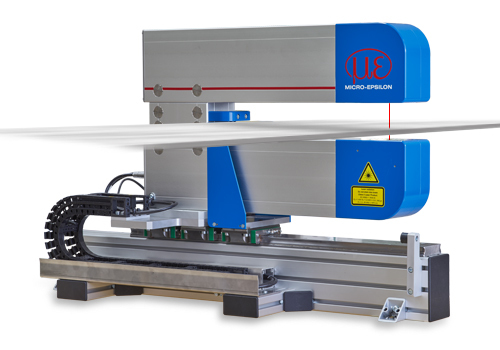 thicknessCONTROL MTS 7202.T is installed on a linear axis, which enables semi-automatic calibration and manual adjustment of the measuring position. For fully automatic calibration and positioning on three adjustable positions, the linear axis can be enlarged using a DC motor.